Patek Philippe needs no introduction. You’re probably here as an admirer of the brand and someone whose dream is to own one of these exclusive timepieces. Even if you own a Patek, there’s a good chance it sees very little actual time on the wrist and instead is safely stowed away for future generations. In this article, we’ll be taking a look at four of the bestselling Patek Philippe watches on Chrono24 and what makes them so special. The Nautilus had rough beginnings and was long considered Patek Philippe’s “enfant terrible” for what was, at the time, its revolutionary design and use of stainless steel. Today, however, it is one of the most sought-after watches in the Patek catalog. The current standard model, the 5711/1A, was introduced in 2006 in celebration of the Nautilus’ 30th anniversary. The original Nautilus from 1976 bore the reference number 3700/1A and was designed by the late Gérald Genta. Production of this model ceased only a few years after its release. The 5711/1A—more specifically, the bestselling 5711/1A-010 — is the closest thing to the original Nautilus in the current collection. However, unlike the 3700/1A, this modern timepiece features an in-house Patek Philippe caliber and a slightly altered case construction. Many Nautilus models come with a long waiting list, and prices have skyrocketed in recent years. There was a time when small gold watches were the trend, even at Patek Philippe. One such watch appeared in the Calatrava series: the 3944J. A quartz movement allowed this 33-mm timepiece to be both very thin and very accurate. The Calatrava has always been the perfect men’s dress watch, and the 3944J was no exception. It has since been discontinued, and the most similar Calatrava from the current collection is the 5119J with the caliber 215 PS. Yellow gold, a small seconds dial, and a hobnail-patterned bezel define these watches and make them recognizable as Calatravas. The trend away from quartz movements and small cases means the 3944J is relatively affordable today. The Aquanaut was introduced in 1997 as the Nautilus for a younger audience. Equipped with the same movement as the Nautilus, the Aquanaut had a sportier design. For example, the reference 5167A-001 comes with a rubber strap that underscores its sportiness. Although the Aquanaut used to be viewed as the poor man’s Nautilus, opinions have since changed. Today it sits on an almost even playing field to the Nautilus, and the demand for Aquanaut watches is quite high. The Aquanaut is available in a number of models, including those with a chronograph or GMT function. 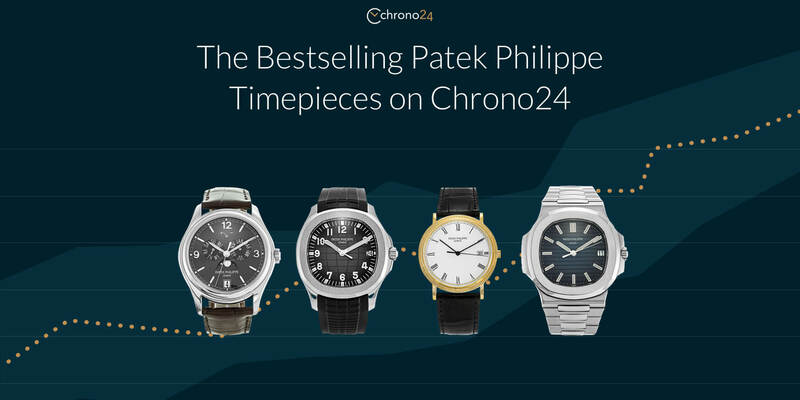 However, the standard version remains the bestselling Aquanaut on Chrono24. It contains the caliber 324 S C, which also powers the Nautilus 5711/1A. While the Aquanaut is not as iconic as the Nautilus, its following continues to grow and will likely continue to do so as time goes on. Interestingly, not every Patek Philippe collection has a fancy name. The Complications and Grand Complications collections feature watches named after the complication(s) they feature. For example, the Grand Complications series includes timepieces with both perpetual calendar and chronograph functions. In the Complications collection, we find world time watches and, in this case, watches with an annual calendar. Annual calendars only need to be corrected once a year on March 1st. This complication is very practical as long as you store the timepiece in a watch winder whenever it’s not on your wrist. The Patek Philippe Annual Calendar 5146G-010 comes in white gold with a mesmerizing slate gray sunburst dial. The combination of a 39-mm case and a beautiful alligator strap make it the perfect modern dress watch.